It’s cyclops time! Woo! The cyclops is one of the best comic book monsters I’ve ever seen- It’s absolutely profane and alien, all at once. A three lobed mouth that looks almost like one of Guillermo Del Toro’s freakish mutant vampires from Blade 2, though not quite, an enormous eye with eyelids that close along a vertical line, enormous breasts running in three rows down its chest- it definitely stands out. We get introduced to new gods this issue- Hera takes a greater role than in the past, and we get properly introduced to Apollo, and more especially Dionysus. Poseidon still takes the cake as the most visually striking god, but Apollo and Dionysus stand up quite well themselves. 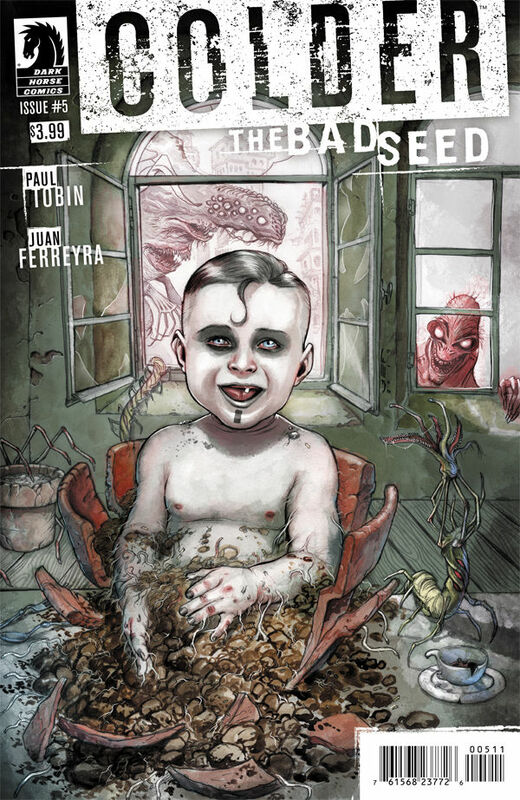 Colder: The Bad Seed hasn’t been quite as enjoyable to me as the first volume. That’s not to say it’s bad, by any means- in fact, it’s still quite good. Swivel, for all that he is visually much creepier and more intimidating than Nimble Jack was, otherwise is simply much less intimidating as a villain. His actions are simply more predictable- steal fingers, plant fingers, steal fingers, plant fingers, ad nauseam. In addition, the hand dogs from the first volume were much more interesting before it was revealed that they were merely minions of Swivel- it merely served to make the universe feel smaller. Still pretty enjoyable though, and it will be interesting to see the return of Nimble Jack next volume. Intersect finally takes the time to delve into the backstory of the characters before… well, whatever happened to Detroit happened. This is a genuinely difficult comic to write about- it’s just so reliant on the vaguely abstract watercolored images that without going into depth and actually analyzing different panels, I have trouble bringing any of it forwards by itself, rather than as part of the whole. Eh, it’s an annual issue, what is there to say? It’s just a collection of quick short comics done in Thor’s past-present-future structure, albeit in the opposite order. Old King Thor continues to restore life to the Earth, the new Thor proves herself to the Warriors Three, and Young Thor gets really, really drunk. 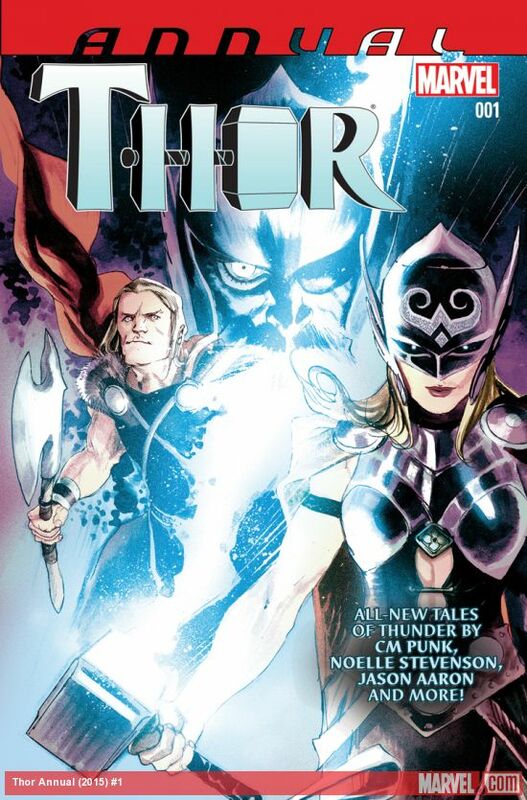 The Young Thor section does feature Rob Guillory on art, for all the Chew fans out there. Overall, it’s enjoyable enough. Only three issues left until Deadpool kicks the bucket! 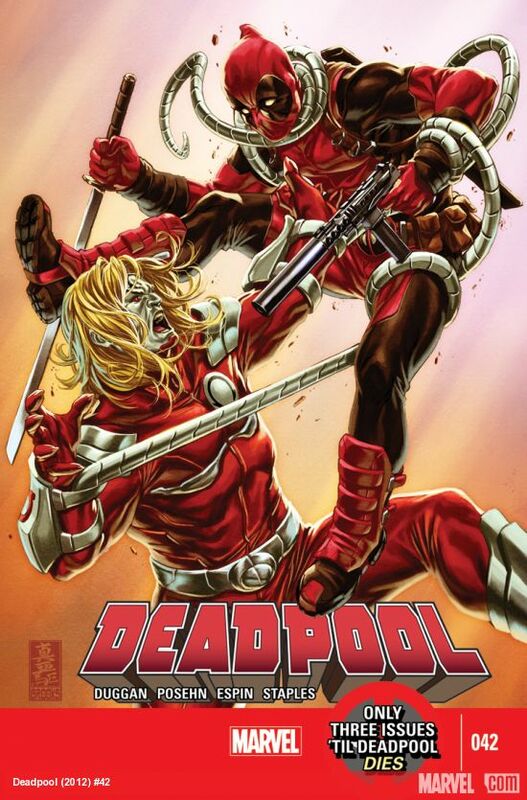 Deadpool’s teamup with Paste Pot Pete vs. Omega Red continues. …Eh, it’s enjoyable enough, but I’m rather more interested in seeing him spend some quality time with his loved ones before his death. I’m a little burnt out on the series for now, really, in no small part thanks to crossover events. Posted in Comics, Weekly Pull Review and tagged Chew, Colder: The Bad Seed, Dark Horse, Deadpool, Image, intersect, Marvel, ODY-C, Thor on February 28, 2015 by mountainwashere. ← The 2014 Nebula Nominees have been announced!